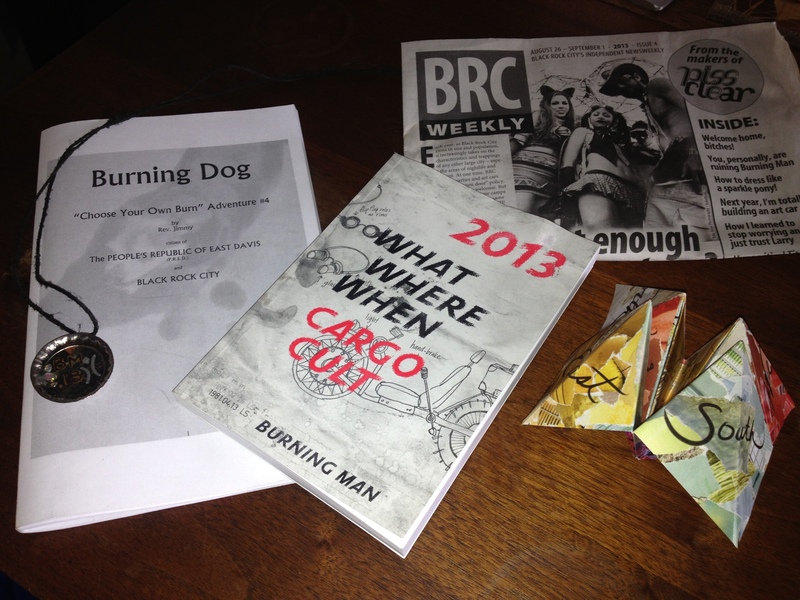 A random sample of schwag from burning man includes: a pendant BRC 2013, the guide to events book, a copy of the daily paper, a folded navigation game, and a choose your own adventure book. People always ask me about the burning man gifting policy. It’s basically the idea that when you go to burning man everything is free. It’s suddenly like you have 50,000 friends who invite you over to their party. You bring gifts for the host and the guest get giveaway bags that are really creative. What would you bring to a party? Most of the gifts on the playa are elaborate versions of normal party things. Some people bring food, drinks, games, music, dance moves, and other gifts for their new friends. Many people bring simi-marketing related things like stickers or magnets. Burning man has a policy against commercial things so typically schwag is just for fun. Lots of people make cool pendents and jewelry. It’s also common to receive practical things like lip balm or sunscreen. Out on the playa one of the easiest and most appreciated gifts are those of comfort. If it’s hot then having a fellow burner offer some cool mist spray is very welcome. Or if it’s cold out then hot beverage really make people happy. It’s the little things that make the community bond together. Many camps provide services that are expensive for the single camper to pull off in the middle of the desert. Community showers, kitchens, and shelter (from heat, cold and wind) are high on the list. This year out camp gave out frozen otter pops to our neighbors during the heat of the day as one of our playa gifts. It’s incredible how much love and gratitude this gifting / non commercial policy creates. You find yourself thinking of new and creative ways to give back. What unique thing can I do for other people? What can I give that will be appreciated and enjoyed on the playa? It’s a great way to look at the world. For me it’s a reminder that giving is just as pleasurable as receiving. Depending on who you are, it might be the receiving part of the equation that instigates the most personal change. However you choose to experience the playa gifting community – it’s almost guaranteed to change your outlook on life. Even Diddy described the experience as life changing!